The well-maintained hotel offers compact rooms with small desks and upholstered window seats. Panel TVs are mounted up high, so the comfy bed is an ideal spot to sprawl out and watch a favorite show. 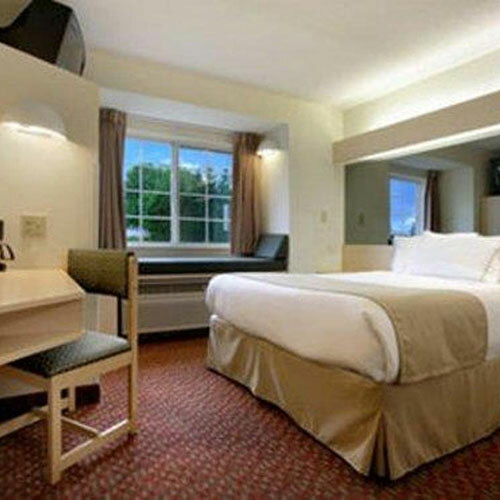 The single queen rooms are perfect for solo travelers who don't need a lot of space or extra amenities. Studio suites feature a wet bar with microwave oven and mini-fridge, with a queen bed and a pull-out sofa. Waffles are included with the small continental breakfast offerings. Smoke free premises. 60 units. 2 stories, interior corridors. I-40/85 exit 145, just s on SR 49, then just w. 2185 W Hanford Rd 27215.